In the summer of 2014, we began work for California's Department of Transportation (CalTrans) to study wildlife movement along Highway 67 in San Diego's backcountry. State Route 67 is a busy road that is the main thoroughfare in and out of the community of Ramona. High speeds, a winding road, and heavy traffic have led to many accidents along the stretch of highway between Lakeside and Ramona, but this road is not just dangerous for people; safe crossings for wildlife are a major concern for conservation planning in San Diego County. The conserved lands and native habitats adjacent to the road mean that a lot of wildlife live in proximity to the SR-67, but crossing the highway poses a danger to those animals. We are studying the existing culvert structures, investigating roadkill, and using previously collected data on bobcat movement to help CalTrans plan for making Highway 67 safer for wildlife. We will be collecting data on all medium to large animals using remote cameras and roadkill data collection, and in particular, we will be focusing on bobcat (Lynx rufus) and ringtail (Bassariscus astutus). CalTrans will be using this data to inform planning efforts on their currently proposed ﻿﻿median barrier project﻿﻿ and eventually, on the planning for the widening of the highway in the future. In the beginning of 2016, we received funding to continue work on improving connectivity in the area surrounding Highway 67 from the San Diego Association of Governments. 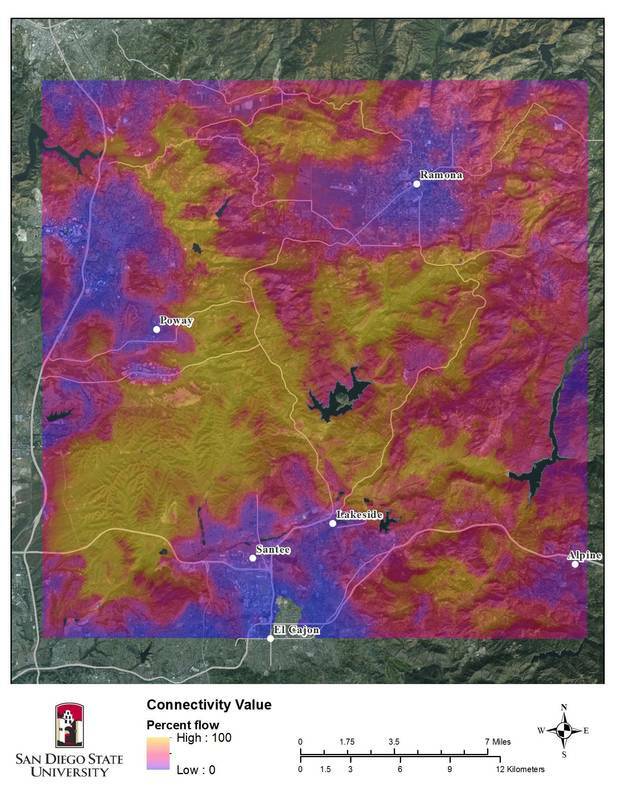 In June 2017, we completed a comprehensive connectivity analysis using existing data on a suite of local species ranging from pumas to wrentits in an expanded area beyond the highway. We combined data contributed by partners from the San Diego Management and Monitoring Program, including collaborators at the USGS Western Ecological Research Center and the San Diego Natural History Museum, among others. Using cutting-edge analytical techniques, we synthesized data from remote cameras, GPS tracking, genetic assessments, roadkill, and baseline biological evaluations of protected areas. ​We worked closely with a range of stakeholders during this process to take the results from our connectivity modeling and use them for prioritization of conservation actions, including a wildlife infrastructure plan for the highway. 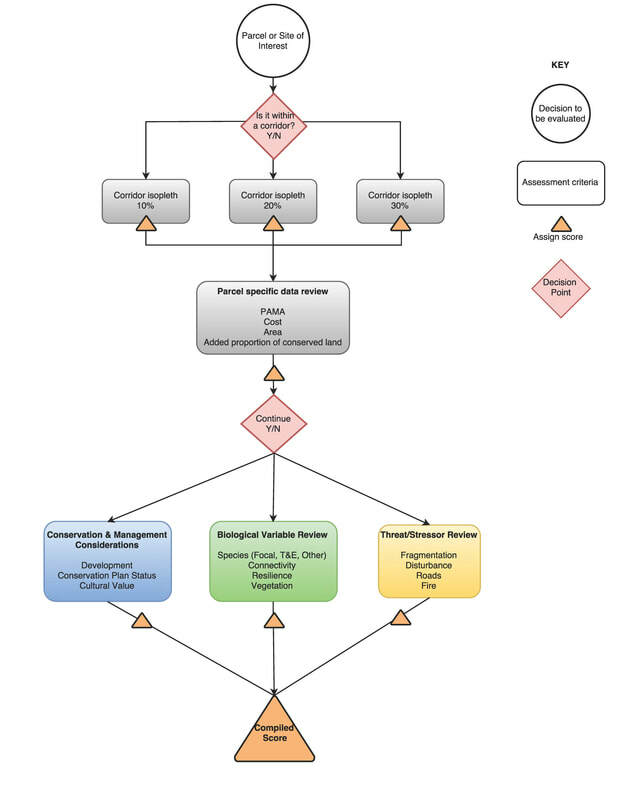 We also developed a decision support tool based on our data products to support strategic conservation actions such as acquisitions, restoration, and other habitat enhancement activities.